“Over recent years we’ve been working to ensure that we offer the ideal combination of products, design skills and support for installers to be able to offer their customers energy efficient and renewable systems, from underfloor heating and solar thermal through to air source and ground source heat pumps,” says Adrian Troop, Nu-Heat’s Sales & Marketing Director. With any system supplied by Nu-Heat, our experienced designers ensure that the greatest levels of energy efficiency are achieved and that installation is as straightforward as possible. All specific design parameters of a property are included, such as location, building construction, floor construction, air tightness, heat loss and how a building is to be used. For underfloor heating, we also consider heat transfer characteristics of the floor construction, the location of manifolds and the final floor coverings. For a heat pump project, we undertake precise calculations to ensure that the heat pump is sized correctly. Our specialist software runs a simulation of performance over an average year, based on local monthly weather data. Heat pump systems are designed in accordance with MIS 3005, which stipulates that the heat pump must cover 100% of the load for all but the coldest 1% of the year. Nu-Heat’s design software fully complies with all MIS MCS standards and our experience with design and supply will give installers total confidence in installation and performance. All installers have a dedicated Nu-Heat Account Manager who is available to discuss existing projects and help with decisions for future ones. Free technical support is available from our team of engineers and sales staff are trained to a high level, understanding the more complex technical issues associated with renewable systems and the MCS. Nu-Heat also supplies extremely high quality user guides for the homeowner, helping to ensure that they have confidence with how to use their new heating system and reducing the likelihood of call-backs. For installers new to the renewables market, Nu-Heat offers assistance through the MCS process, helping with accreditation and on-going compliance. Inclusive technical support is available throughout an installation, including commissioning and inspection of a heat pump system prior to MCS inspection. Our comprehensive Customer Handover Pack includes complete documentation on everything needed to comply with MCS guidelines and eligibility for the Premium Payment and RHI schemes where applicable, fulfilling a large part of the MCS requirement for each installation. Nu-Heat’s renewable product range includes a variety of MCS approved heat pumps, allowing us to specify the right size and most appropriate model, whether ground source or air source, for each project. We also offer solar thermal systems for domestic hot water, including a single panel option for more compact homes. Our range of hot water cylinders includes a 540-litre option, well matched to the larger heat pumps (both air and ground source) and more compact hot water cylinders that fit into a smaller home. Integration is one of Nu-Heat’s core skills and our heat pumps, solar thermal collectors and warm water underfloor heating all integrate to provide an energy efficient system. 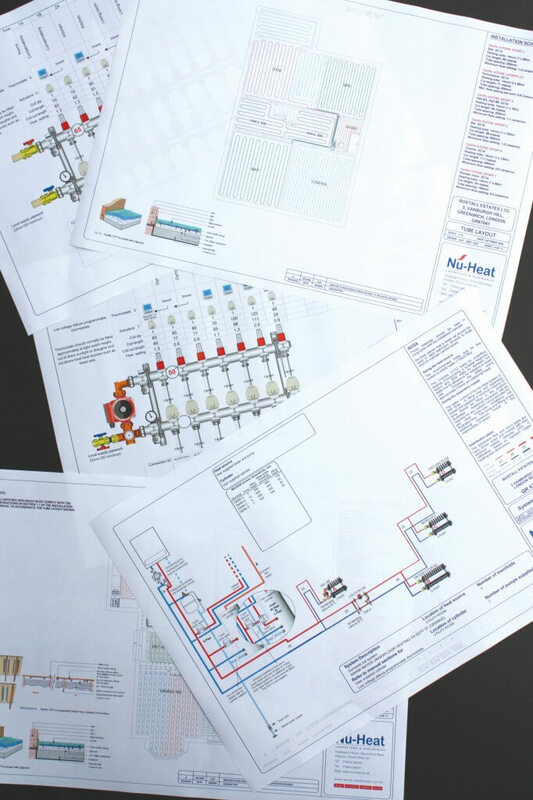 Each system is supplied with comprehensive M&E ‘docking’ drawings to illustrate exactly how the various components should be fitted and then linked to each other. Heat pumps, particularly when partnered with underfloor heating, offer a potential solution not only for new build but also for older properties, as long as the building meets the required insulation levels. This is usually achieved through a combination of improvements to walls, attic space and glazing. For such properties, Nu-Heat has developed a retrofit underfloor heating floor construction option, LoPro®10 to offer a solution to the problem of floor height build up. LoPro®10 offers one of the lowest profiles currently available at 15mm plus tile, wood or carpet floor finish. LoPro10® panels are of a composite gypsum construction giving low thermal resistance and high-density properties that provide high thermal output compared to similar low height plywood and chipboard based systems. LoPro10® also has one-third less thermal mass than a screed floor, allowing it to heat up and cool down rapidly.